Food stories featuring heritage recipes and new experiments. 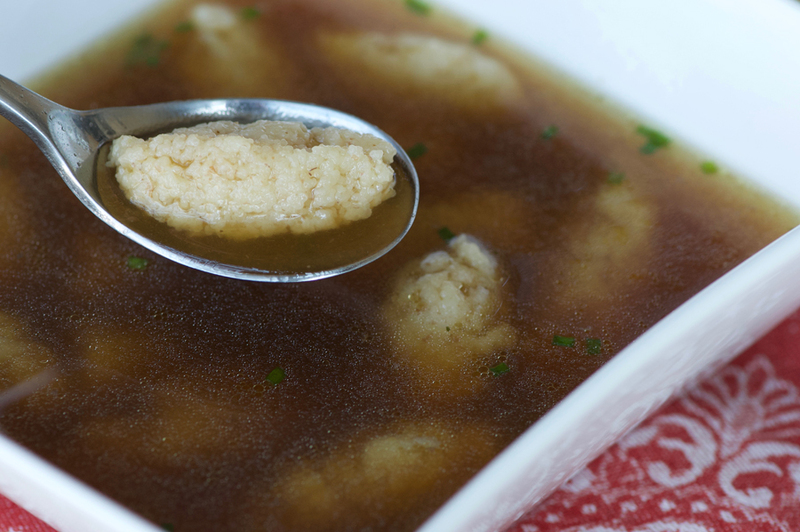 Rich and savoury beef broth with fluffy cream of wheat dumplings add up to pure comfort in a bowl. This recipe packs a two-for-one punch: make the broth recipe, use part of it for the dumpling soup, and then freeze the rest to use later as your very own personal stash of beef stock. It will do wonders for pan sauce, add body to gravy and is so much better than using canned broth. There is something very satisfying about taking a cheap bag of bones from the butcher shop and turning them into a delicious, healthy broth. Making bone-broth changed me. Now I look at bones from roasts, steaks, etc as possible additions to my next bone broth—I simply carve off most of the meat (leaving a bit on helps flavour the broth) and freeze the bones, saving them up until my next batch. While bone broth has been trending these days as a source of collagen and minerals, Grandmothers everywhere have been making it for decades, and for good reason. The nice thing is you really don’t have to worry too much about exact measurements when it comes to making homemade broth. 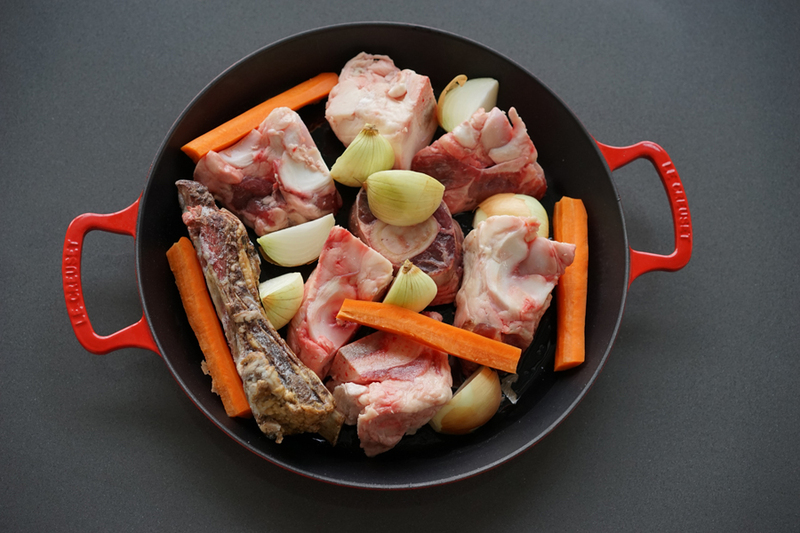 Work with as many bones as you can fit into your stock pot, top with water, add a few veggies and flavourings and let it all simmer for hours. To extract maximum flavour from the bones, roast them in the oven first. This will provide crisp, darkened bits of flavouring to enhance your broth. I add the carrots and onions to bring out their sweetness as well. The roasting pan will emerge an hour later, crackling, sizzling and full of lots of browned bits. 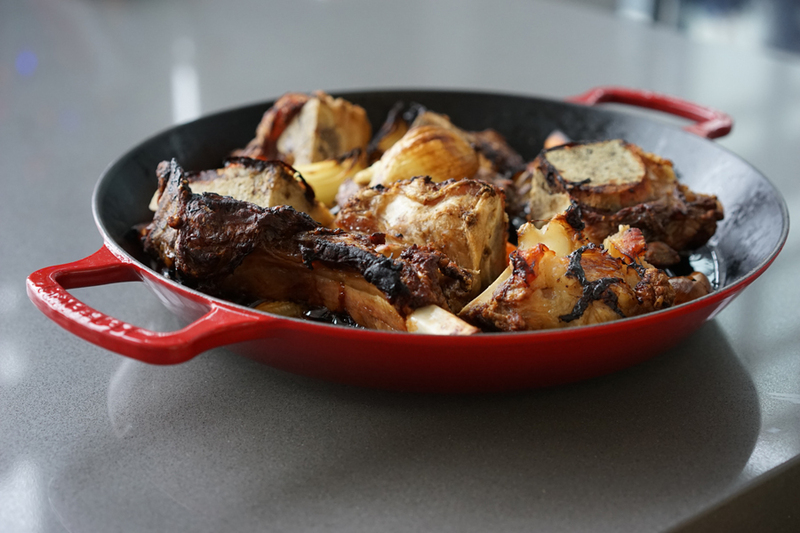 Once you’ve roasted the bones, remove them from the roasting pan and place them in a large stockpot. 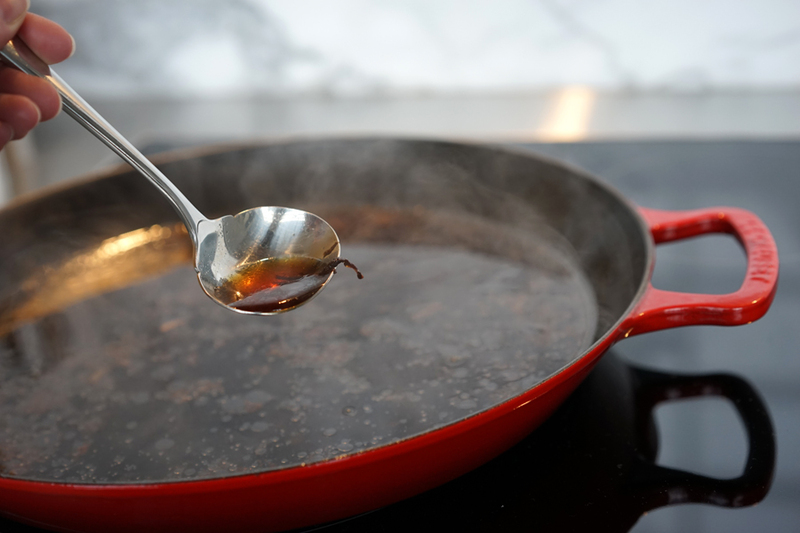 Add water to the roasting pan and scrape up the browned bits at the bottom of the pan (this process is similar to the early steps of making gravy). The water will take on a lovely deep golden hue as you pull up all the flavour from the roasted bones and veggies. Once you’ve scraped it all up, transfer the water and any browned bits to the stockpot. Add the bouquet garni, celery, and top with water to fully cover the bones. At this point, you can pretty much walk away, simmering the pot for hours, checking on it every hour or so to stir things up a bit. I simmer my broth uncovered to condense the flavours. It saves space in the freezer and I just add water back in as needed when I’m ready to cook with it. Once done (five hours should be plenty of time but you can simmer a bit longer if you like) remove the bones and meat from the pot. (if you have a dog, they will go crazy for the soup meat (which you should remove from the bone before giving to them so they don’t choke on any bone pieces). Otherwise, it tends to be pretty flavourless after all that cooking and can be discarded.) Strain the stock into a separate container to remove any small bones or pieces so you are left with simply the pure, clear broth. Ideally, allow this to cool and place in the fridge overnight. This step will cause the fat to solidify at the top of the broth so you can easily lift it out in one piece and discard it. Otherwise, if you don’t want to wait, skim the fat from the top by hand before adding to any recipes. With the fat skimmed off of the broth, one trick to freeze it is to use an ice-cube tray to freeze into 1-2 tablespoon cubes. You can freeze these in a ziplock baggie to drop into sauces, gravies etc. You can also use larger ziplock containers depending on how you plan to use it later. Remember to add a label with what it is and the date you made it! Now, on to the Cream of Wheat Dumplings! These are based on a classic style of dumpling originating in Austria, known as Griessnockerl. Traditionally, I believe these were made with Semolina flour, however I use Cream of Wheat which is more readily available and makes for a nice, fluffy dumpling. These are super easy. Start with room temperature butter, an egg, and some salt. 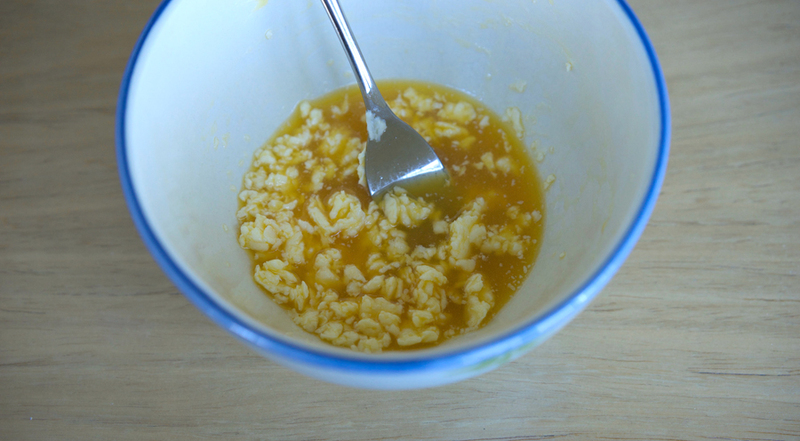 Mix with a fork until the mixture is lumpy and looks like the photo below. Next, add the cream of wheat and combine well with a fork, stirring and pressing for about one to two minutes. The mixture will be smooth and fairly firm. It should sit for ten minutes before you cook it. I once left it out for an hour causing it to get too soft. Then when I went to add it to the soup, it all fell apart. So don’t leave it for too long. Ten minutes is perfect. 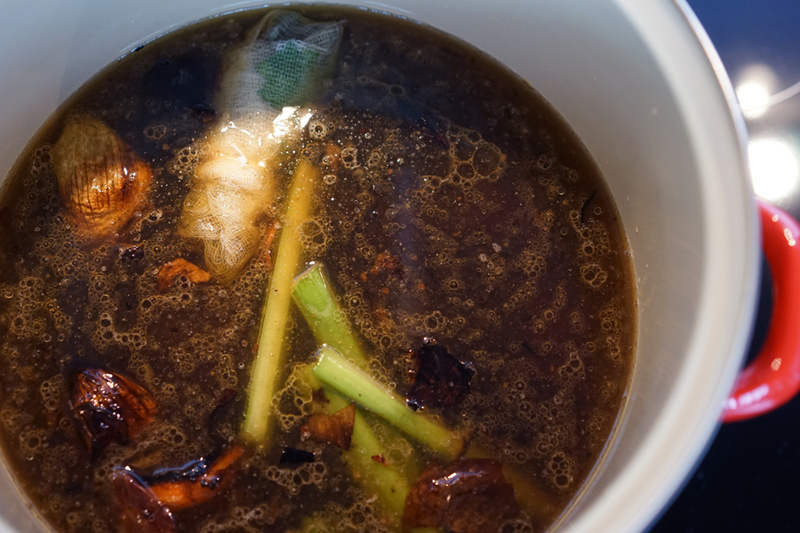 While it’s resting, heat up your beef bone broth and water. Add a bouillon cube and bring to a boil. Do a taste test for salt and flavour levels—usually I find more salt is needed. When the broth tastes right, and the dumpling batter is ready to go, it’s time to shape those dumplings! This step takes a bit of practice. Use two spoons (very small spoons, ideally, as these dumplings will easily double in size while they cook). Pick up about 1/2 teaspoon of the dumpling batter in one spoon. Use the second spoon to shape into an oval shape, pressing the dumpling together. Drop into the soup, and keep going until all of the dumplings are done. Allow the batter to rest for ten minutes before you start to shape the dumplings—but not much more than fifteen minutes, to avoid the batter becoming too soft. Don’t have the broth at a rolling boil when dropping the dumplings in, keep it at a gentle simmer. Shape the dumplings fairly tightly so they hold together well. If they are too loose they might fall apart in the broth. Depending on how large you made them, the dumplings usually take about ten to fifteen minutes to cook. They will float to the top when they are close to being done. Test one first, by cutting through it. The inside should be a uniform consistency. If the centre is still hard, you need to cook them a bit longer. Serve sprinkled with freshly chopped chives. Some Maggi (seasoning sauce) at the table is always a good idea too in case anyone wants a bit more flavouring in their soup. 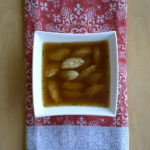 A nice appetizer before a meal, or as a light lunch, this soup is both comforting and delicious! 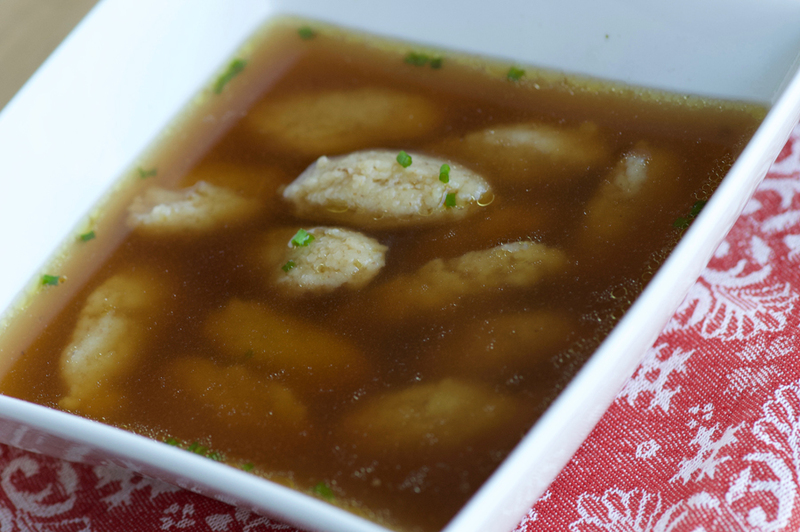 A beautiful savoury beef broth full of natural collagens with fluffy cream of wheat dumplings. A traditional Austrian soup often served as a first course. Preheat oven to 450°. Spread bones, veal shank, onion and carrot in a roasting pan. Transfer to the oven and roast until dark brown in places, about one hour. 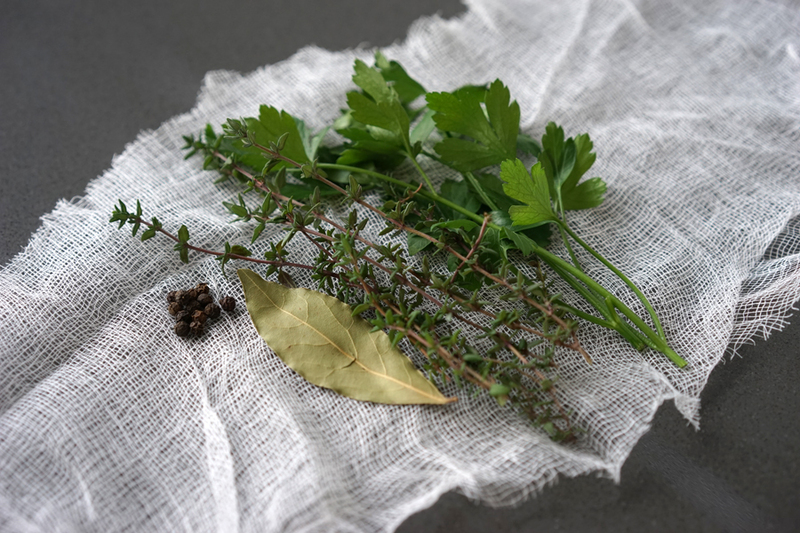 Make bouquet garni: wrap herbs, Bay leaf and peppercorns in a cheesecloth and tie with kitchen twine. Transfer the roasted bones and veggies into a large stockpot. Add approximately two cups of water to the roasting pan, scraping up browned bits from the bottom. If you roasting pan is stovetop-safe, heating it on the stove may help loosen more bits. Add to stockpot with celery pieces. Top pot with water until bones are covered, and bring to a boil. Add salt. Froth will develop at the top of the stock, especially during the first hour. Skim and discard the foam. Simmer gently uncovered for five to seven hours. Remove large bones and pieces from the pot and discard. Strain the broth through a fine sieve. Cool and refrigerate overnight to allow the fat to solidify at the top, remove. Transfer to storage containers and freeze/use as needed. Heat beef broth and water, add bouillon and taste and adjust seasoning as required. Bring to a gentle simmer. In a small to medium bowl beat egg. Add butter and salt, and combine well with a fork. 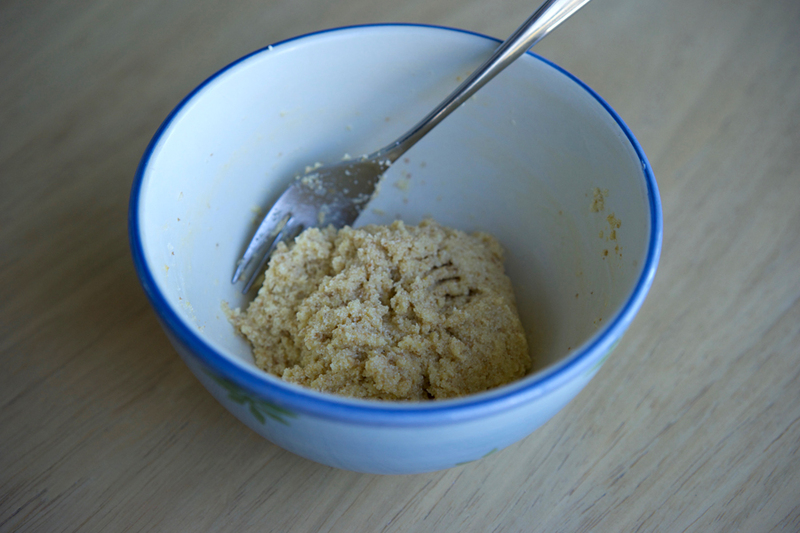 Add cream of wheat and mix well with a fork, pressing to combine ingredients. Allow to rest for ten minutes. Using a very small teaspoon, take 1/2 tsp of batter and use a second spoon to shape it into an oval dumpling, pressing together. Drop into the broth. Continue with the rest of the batter. 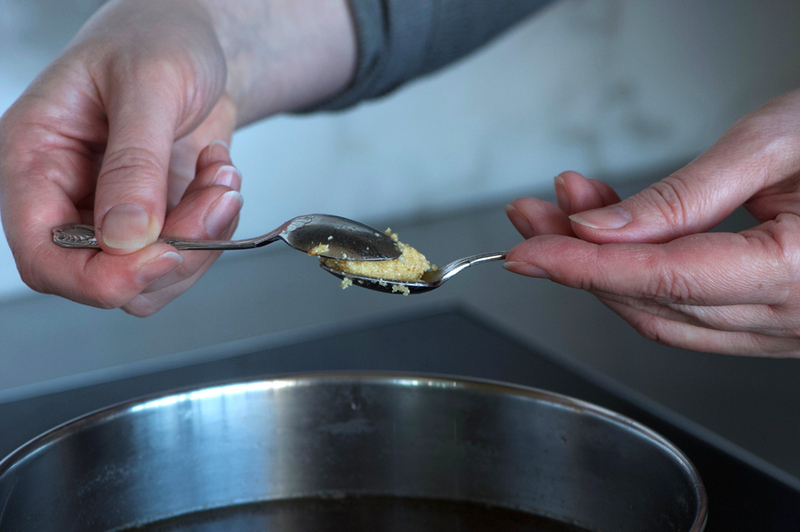 If your spoons get sticky, drop into the broth between shaping. Keeping the broth at a light simmer, cook the dumplings until they float to the top, about ten minutes. Check to see if they are done: cut one if half and see if the centre is consistent. Taste—if the middle is hard, cook for an additional five minutes or so. Serve topped with finely chopped fresh chives. I love bone broth AND cream of wheat, so this is right up my alley! I am so excited about this! I would’ve never thought of adding cream of wheat as the dumplings! Bone broth is so nutritious. I often wonder why I don’t make it more often. I’d love to try your recipe with a gluten free dumpling. Bookmarking this for reference! Yummy!